The 2008 season began on October 4, 2007, with the announcement of a new Vipers owner and head coach. Doug MacGregor, the principal owner of Texas AF2 Holdings, LLC, purchased the team, becoming the third owner of the Vipers. Dean Cokinos was hired to lead the Vipers into battle and was the sixth head coach in team history. The 2008 regular season started off slow for the Vipers as the team opened with three games against playoff teams from the 2007 season. The Vipers were being led by Andy Hall, a signal caller from the University of Delaware. The home opener against South Georgia was not decided until the final play of the game when the Wildcats snatched victory from the jaws of defeat as they beat the Vipers 59-55 on a bizarre lateral play. The second home game, against Green Bay, was a defensive battle that saw the Blizzard move out to a big lead heading into the fourth quarter. Largely ineffective, quarterback Andy Hall was replaced by Brent Dearmon, this change led to a fierce comeback by the Vipers. The game was not decided until the final minute, but once again the Vipers were left out in the cold by the Blizzard 37-35. Andy Hall was traded to the Austin Wranglers after the Green Bay game, Dearmon was now the signal caller to lead the Vipers going forward. The Vipers first road game of the season was against their bitter rival, the Florida Firecats. The Firecats soundly defeated the Vipers 62-47 to send the Vipers back to Huntsville with a 0-3 record to start the season. The season, at this point, looked like a tough uphill battle, however, the Vipers fortunes were about to change. The Vipers were clearly a work in progress, in game four, a home game against Louisville, the team’s fortunes finally changed course. Dearmon led the Vipers to their first win of the season, a badly needed win over the Fire 41-30. Alonzo Nix, a wide receiver from Tennessee – Chattanooga, made his first appearance in a Viper uniform. Nix helped to solidify the receiving corps with a bonified 1-2-3 punch of Maurice Brown, Nix, and Gary Elliott. The following week, the team traveled to Daytona Beach and beat the Thunderbirds 48-32, a game in which backup quarterback, Kevin Eakin, saw his first action for the Vipers. The team next traveled to Albany, New York to face the Conquest. The Vipers trailed 35-12 in the second quarter against the Conquest. As a result of the sluggish offensive effort, Dearmon was replaced by Kevin Eakin, who finished the game with five touchdown passes and led the Vipers to a huge comeback win over the Conquest 61-49. The Vipers believed that they might have found the magical missing piece at quarterback. Eakin was named as the team’s starter for the next game, a road game at Albany, Georgia. As result of this change, Dearmon left the team shortly thereafter, and Tony Colston was signed to be the team’s backup quarterback. Eakin did not disappoint the Vipers faithful in the starting role as he led the team to four consecutive wins, 65-51 at South Georgia, 50-34 against Florida, 77-37 at Oklahoma City, and 64-48 over Kentucky. The team was clearly on a roll having won seven straight games and now sitting with a record of seven wins and three losses just ten games into the season. With the recent success on the field, the Vipers could realistically think about a potential appearance in the post season. However, the drive to the playoffs was not to be without a few bumps in the road. That first bump was a defeat at the hands of the Wilkes Barre\Scranton Pioneers 77-49. The Vipers bounced back the following week in Moline, Illinois as the Snakes defeated one of their longtime rivals, the Quad City Steamwheelers, 55 – 35. Bump number two was a home defeat against Stockton, in overtime, 47-41, the team looked lethargic in this loss and gave the team a record of eight wins and five losses with three games to go. The next two weeks, the Vipers got back on track by destroying Daytona Beach 73-21 at home and following up that performance with a road victory at Florida over the Firecats 58-28. The victory over the Firecats locked the Vipers into the playoffs, but the team had its sights on a more immediate goal, winning a division crown. Heading into the final game of the season against South Georgia, the Vipers trailed the Wildcats by a single game in the division standings, the winner of this game would win the South division crown. The Vipers trailed most of the game against South Georgia. The Vipers took their only lead of the game, 50-47, with just under five minutes to go in the game. South Georgia scored on its next possession to retake the lead 54-50. The Vipers would have the ball with one more opportunity to win the game. The Vipers drove down the field and with just seconds to go in the game, the Vipers called a pass play from the South Georgia 2 yard line. With no receivers open, Kevin Eakin scrambled to what looked like a winning touchdown, but the hole closed quickly, and he was tackled at the 1 yard line as the game ended. South Georgia won the division and the Vipers ended up with a 10-6 record and entered the playoffs as the number four seed. In the opening round playoff game, the Vipers hosted the arch rival Florida Firecats at the Von Braun Center. The Vipers looked to be in trouble in the game as the Firecats built an early 13-0 lead as a result of two Viper turnovers. Tennessee Valley finally got on the scoreboard on their next possession. On a critical fourth down play, Kevin Eakin connected with Gary Elliott and the Vipers trailed just 13-7. The teams then traded touchdowns with the Firecats leading 20-14 halfway through the second quarter. Momentum then began to swing in favor of Vipers as Desmond Foster intercepted a Firecat pass and returned it 15 yards to pay dirt, giving the Vipers its first lead at 21-20. The next Florida possession resulted in a turnover on downs with just 9 seconds remaining in the first half. The Vipers had time for just one play. Eakin tossed a pass across the middle to Maurice Brown who then faked a hook and lateral pitch and streaked down the sideline into the end zone, the Vipers increased their lead to 28-20 as time expired in the first half. In the third quarter, the teams once again traded touchdowns with the Vipers heading to the final quarter with a 34-27 lead. On the Vipers next drive, Gary Elliot took a hand off and walked into the end zone for the touchdown to put the Vipers up 34-20 after the failed extra point. In the fourth quarter, the Vipers scored on two more possessions to pull away from the Firecats 48-27. Florida scored on the final play of the game thus making the final score, Vipers 48, Firecats 33. The win earned the Vipers the right to face the top seeded Wilkes Barre-Scranton Pioneers the following week in Pennsylvania. The second round game against the Pioneers was a defensive struggle. After both teams failed to score on their opening possessions, Tennessee Valley took advantage of a Pioneers fumble and marched 41 yards for the first points of the night, leading 7-0. But the Pioneers answered right back with their own touchdown, the score after one quarter was 7-7. In the second quarter, the teams traded touchdowns, making the score 14-14. The score remained unchanged until the final play of the first half. Vipers head coach Dean Cokinos sent his field goal unit onto the field, however, after a time out from the Pioneers, Cokinos elected to try for a touchdown. A touchdown was indeed scored, unfortunately for Tennessee Valley, it was scored by the Pioneers after intercepting a Vipers pass and returning it for a touchdown. The score at halftime was 20-14 in favor of the Pioneers, after a failed Pioneer two-point conversion. After halftime, the Vipers defense stepped up again to force a Pioneer field goal, Wilkes-Barre led 23-14. The Vipers offense responded by engineering a 40-plus yard drive ending with a touchdown catch, cutting the lead to 23-20 after the extra point failed. In the fourth quarter, the Vipers took their first lead of the second half thanks to an 8 plus minute touchdown drive, putting the Vipers up 27-23 with just over two minutes left in the game. Larry Kendrick then took the ensuing kickoff 56 yards for a score to put the Pioneers back on top 30-27. The Vipers had one more chance to take the lead and Alonzo Nix's fade route touchdown catch with seven seconds remaining in the game proved to be the difference, the final score was Vipers 34, Pioneers 30. 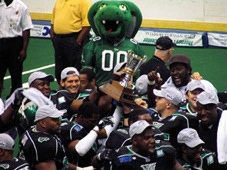 This victory, coupled with a Manchester victory over Green Bay, gave the Vipers the right to host the American Conference Championship game the following week in Huntsville. The Vipers simply would not be denied in the American Conference Championship game. The Vipers took the opening kickoff and marched 45 yards in five plays, for a 7-0 lead. Manchester turned the ball over on each of its next two possessions and the Vipers made the most those opportunities by cruising to a 21-0 lead after one quarter. In the second quarter, Manchester answered with a nine-play, 45-yard drive to make the score 21-7. The Vipers then answered with a 47 yard drive in five plays for a 28-7 lead. On the final scoring drive of the first half, Manchester scored to cut the lead to 28-14. In the third quarter, the teams traded touchdowns, the Vipers led 35-21 heading to the final quarter. In the fourth, the Wolves closed within a touchdown, 35-28, but could get no closer. The final score 45-35 in favor of the Vipers. As the American Conference champions, Tennessee Valley was now heading to the Arena Cup for the second time in team history. The 13-6 Vipers would travel cross country to face the National Conference champions, the 18-1 Spokane Shock, in Spokane, Washington. On the road to the championship, the Vipers beat both conference #1 seeds, a league first. In addition, Arena Cup IX was the first championship game to go into overtime and it was also the first time that the road team had won the championship game. The attendance of Arena Cup IX was 10,662, which is the largest attended championship game in af2 history. In 2009, this game was voted by the league as the greatest game in af2 league history.